This is the transcript of a moderated debate between Alan Robock, a climatologist from the University of Maryland and Patrick Michaels, a climate change skeptic with long standing financial ties to the fossil fuel industry. The topic of the debate was “Must We Act Now To Avert a Climate Catastrophe?” and was part of a longer conference hosted by the Competitive Enterprise Institute called “The Costs of Kyoto” which took place on July 15, 1997. Ben Wattenberg, the moderator of the debate, was a Senior Fellow at the American Enterprise Institute. Throughout the debate, Michaels takes the stance that there is no need for urgent action on climate change. 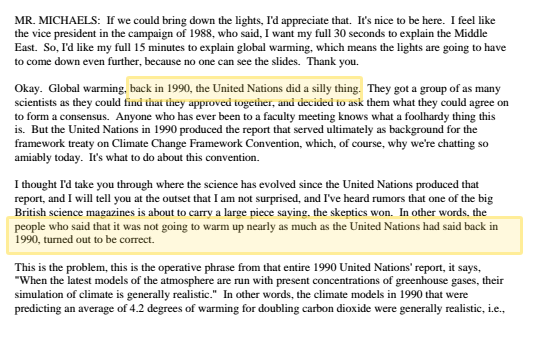 He labels the call by the United Nations for a global treaty on the issue “a silly thing” and argues that the predictions made in 1990 about magnitudes of warming from climate change had already been proven wrong – meaning climate skeptics had been proven right. Primarily citing the work of other noted industry-funded climate skeptics like Roy Spencer, Robert Balling, and John Christy.